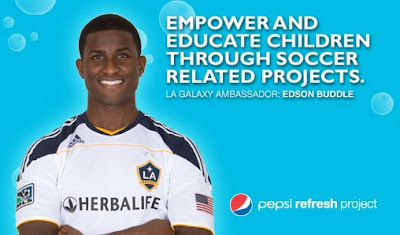 On Sunday, Galaxy forward Edson Buddle and Galaxy Director of Community Development Gloria King were guests on the Southern California Experience with LaFern Cusack on ESPN Radio 710 AM. As part of the Pepsi Refresh Project, Edson and Gloria are encouraging fans to vote for the club's idea in order to receive a $50,000 Pepsi Refresh grant. Fans can cast their vote up to 25 times per day at www.MLSsoccer.com/PepsiRefresh/LA for the Galaxy thru Monday, September 20 at 8:59 p.m.